Not all bookstores have cats: the big chains don't have cats, and some mom and pop stores keep their cats at home, so if you are allergic to cats, you can still find a place to browse for reading material. 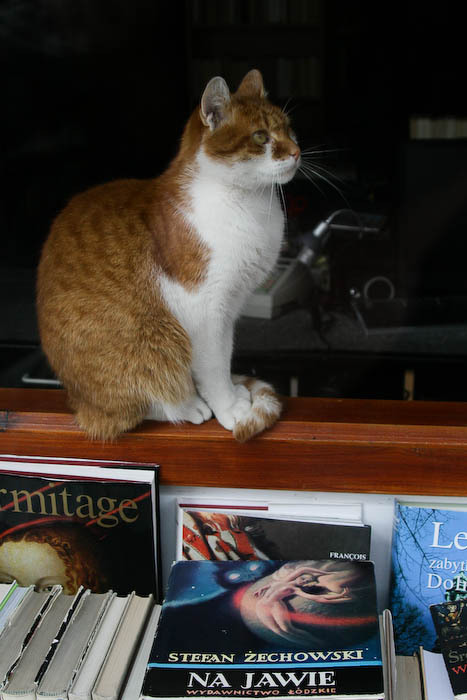 But you'll find resident cats in many independent bookstores because they are nice to curl up with (just like a good book), they don't eat the merchandise, and they protect the premises from rodents who will eat the merchandise. Let's be honest, though - this list has more than ten cats. 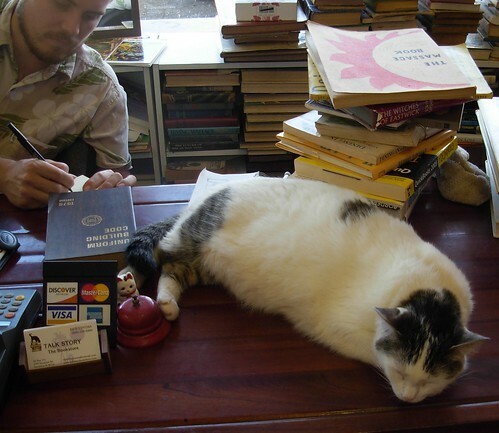 What it is is a list of ten bookstores that have cats. Mudsock Books & Curiosity Shoppe in Fishers, Indiana sells books, games, and children's toys. The resident cat Ralph is another draw, as he has quite a few fans. And he doesn't mind posing for a picture. Photograph by Flickr user Phil Jern. Awesome Books in Pittsburgh has several cats. Pictured here are Cupcake Slim and Mojo. Mojo is the ginger cat; I know because there are other pictures of Mojo with his lion haircut. The third store cat is named Molly. 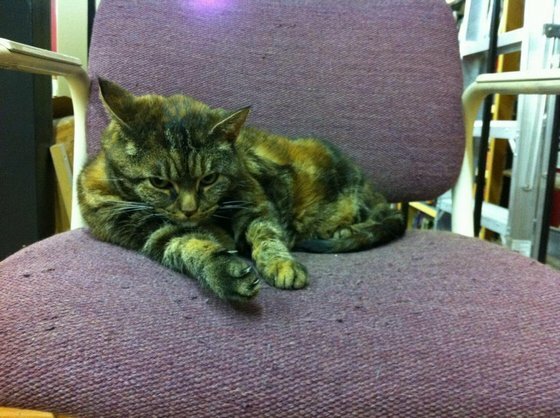 Pegasus Books in Berkeley, California, is proud of all the pets that belong to their staff, but Parit lives at the downtown store. This photograph was taken by an avid Parit fan who is also a blogger. The Other Change of Hobbit is a science fiction and fantasy bookstore in Berkeley. 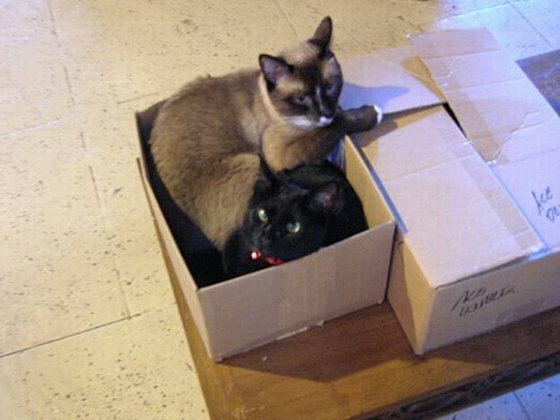 They have two cats, Sam and Trouble. Sam is the more outgoing of the two, and will jump on the shoulders of customers if given a chance. 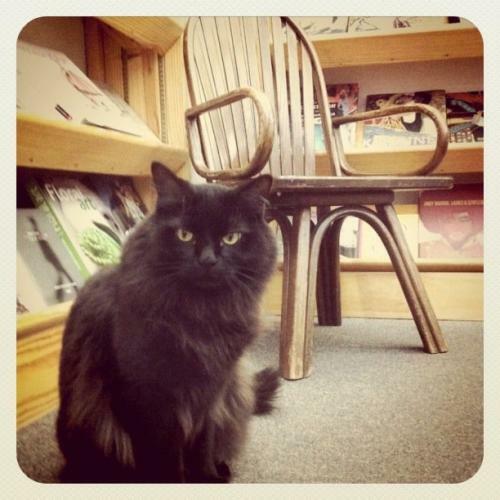 Orinda Books in Orinda, California features their bookstore cat right on the website's home page. They welcome you to come in and pet Ginger, who is accustomed to customers. Here you see her drawing attention to a table of books for sale. Photograph by Karen Lile. Left Bank Books in St. Louis is home to Spike. Spike has his own page at the store's website, with an interview and some of his literary recommendations. Talk Story Bookstore in Hanapepe, Hawaii is the sole bookstore on the island of Kauai and the westernmost bookstore in the United States. Owners Ed and Cynthia Justus are credited with revitalizing the small town of Hanapepe, and have a restoration project going for other downtown buildings. 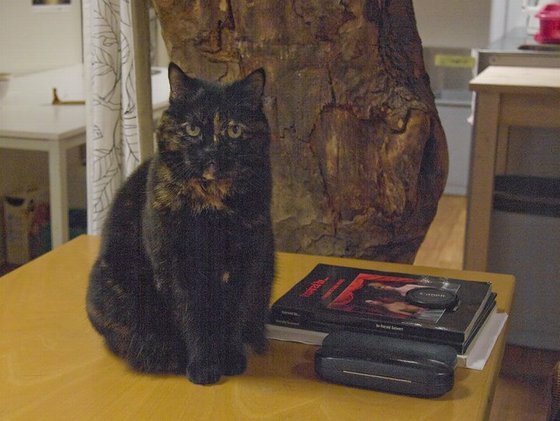 Talk Story Bookstore has three cats, whose names are not recorded online. Here you see owner Ed Justus with one of the cats. Photograph by Flickr user brewbooks. The American Book Center in Amsterdam has an auxiliary clubhouse nearby call the ABC Treehouse. AlleyCat lives there, and has her own Facebook page, where her activities and interests are both listed as "eating." Photograph by Harald Seiwert. Then there is Dante, who is quite the celebrity in Poland. Dante lives at a secondhand bookstore in Wroclaw. 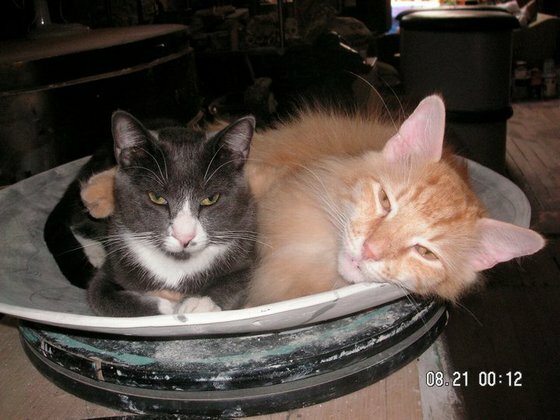 My Polish is rusty, and Babelfish translates "secondhand books" into "scientific antiques," so I haven't found much about the bookstore itself, but Dante has his own blog, and his own Facebook page, where he interacts with fans and other internet cats -in Polish. 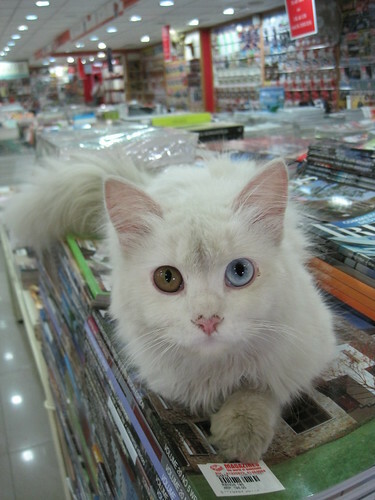 There's not much information available, but I couldn't resist this picture of a colorful white cat who lives in a bookstore in Bangalore, India. Her name is not recorded, but aren't those eyes something else? Photograph by Flickr user najeebkhan2009. This list was inspired by a post at Metafilter which linked all five previous mental_floss Bookstore Cat posts, and where I found comments leading me to several of today's entries. 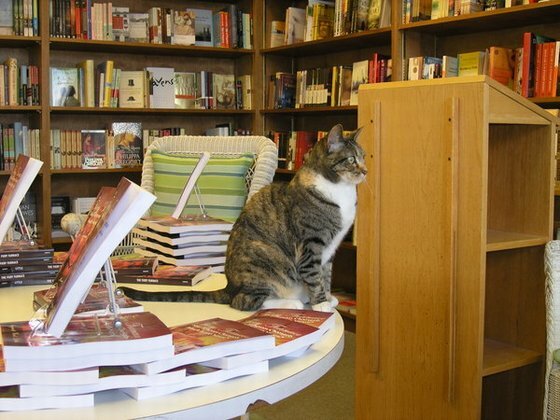 If your favorite bookstore cat isn't listed here, it may be found in one of the previous posts, 12 Bookstore Cats, 8 Bookstore Cats, Our Readers’ Favorite Bookstore Cats (Volume One), Our Readers’ Favorite Bookstore Cats (Volume Two), or Our Readers’ Favorite Bookstore Cats (Volume Three).